This Coffee Table Aquarium is a great add to any bachelor pad. 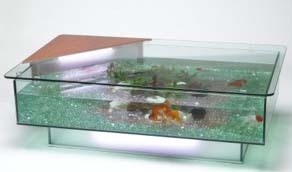 Clear-Seal coffee table aquarium comes with a toughened glass top that has polished rounded edges. It has either a reproduction or mirror corner section that covers the filter and lighting system. All of the coffee table aquariums come complete with light diffuser (the one in the corner to illuminate the tank, the one under the tank is optional), fine and coarse biological sponges, plastic filter cover and acrylic table top support blocks.